Hi folks. Here's little more background behind what was shown in Part I.
Norbert Ladenburger hails from Schwäbisch Gmünd, a little town near Stuttgart at the northern foot of the Swabian Jura Mountains. By trade, he's a goldsmith and owns a small factory there. While one of his big hobbies is building full size kitplanes from America and flying his own machines, Norbert loves getting his hands dirty with bicycles. The idea of building a DIY electronic shifting bicycle started in 2007 when his son was unemployed. So they conjured up this plan to keep them both busy with something. But then his son moved on after having found a job and he tinkered on with the project. Norbert tells me that he built his bicycle using carbon fabric and aircraft quality epoxy at home. Obviously, since he's into building kitplanes, he used materials he already had. For the wheels, he made a negative mold from wood. 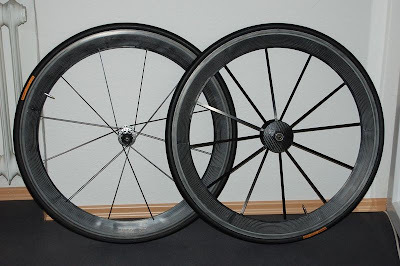 He laminated a half wheel, then the other half and finally glued the left and right parts both together. He tells me that this wasn't an easy process and that there's lots of little things to talk about regarding gluing, tensioning of spokes and the final finishing process but for a basic overview on the wheels, he left it there. The servo is a cheap standard model and the electronics was a kit from a servo-tester. He removed the springs from the derailleur to fit the servo in for push and pull motion. He bought both from a model shop. This site sells the servo and this site sells the electronics. Here's a small image of what he used. Now here's the problem. Because its a simple analog circuit, it has been difficult for him to get to steer the rear derailleur with a potentiometer as the gears must be first searched and found with the pot. The front is a double chain-ring for which the servo apparently shifts fine with a simple toggle switch. Norbert thinks a digital circuit is the solution and apparently is looking to reconstruct the setup in the rear. There was a rumor on the WW forums that he built his setup for 50 Euros. That may be the case for the servo mechanism, couple of electric wires and switches, but the entire bike building project, he estimates, cost him around 500-1000 Euros. But as said before, he did use a lot of materials he already had from the kitplanes hobby side. For most of us, this may take us down memory lane. Back in the early 1990's, MAVIC experimented with a servo controlled rear derailleur powered by batteries in the handlebars with the shifting relying on the motion of the jockey pulleys. But the idea didn't last long. However, some people contend that Mavic put more of their marketing attention into wheels and rims and such which ultimately diverted resources from the electronic shifting project, in the end killing it altogether. It could have been developed and refined, if not limited to what they last had before the idea collapsed. If any of you readers have a note of insight, electronics advice or general help for Norbert, it can be noted in the comments section on this blog and he will be reading it. As and when I get more information from him, I'll update the subtler details of the project here. Crazy German mad scientist stuff. I LOVE IT!